Boston teachers overwhelmingly approved a proposal Wednesday that would more than double the number of public schools with an extended school day — a measure pushed heavily by city, school, and union officials to boost student achievement. About 800 teachers took part in the evening vote at the Boston Teachers Union Hall in Dorchester, ratifying the proposal in a show of hands by a four-to-one ratio. The measure now goes to the School Committee for a final decision in the coming weeks. Union president Richard Stutman, a plan supporter, praised the vote. He said many teachers wanted more time to help their students — and to avoid any sanctions by the state for low test scores. “We wanted to show the state that the city, which has schools teetering on the edge of turnaround status, that we could sit down ourselves and plan something healthy for our schools and not have something imposed on us,” he said. The proposal would add 40 minutes a day to more than 50 elementary, middle, and K-8 schools over the next three years. Teachers would see their salaries increase by $4,464 a year, and they would be guaranteed a say in how the extra time is used. 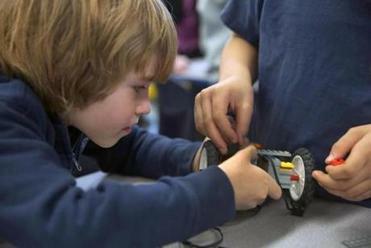 The uneven performance comes as Boston seeks to double the number of schools with extended learning time. Once fully implemented, the change would cost $12.5 million annually. Currently, 38 schools in the system offer an extended day. But the quality of the programs varies greatly. While some of the schools are pushing up achievement with the extra time, other schools continue to flounder. Paul Aegersheim, a music teacher at the Condon School, said he voted in favor of the plan. “Teachers will have more time to do what they do best — mold youths,” Aegersheim said. The first set of schools — yet to be identified — would start an extended day this fall. Each school, working in consultation with staff and parents, would decide how best to use the extra time to meet the specific needs of their students. The extended time would likely be used for a variety of reasons, such as providing more academic interventions and opportunities to participate in the arts, robotics, and other subjects. It would also provide time for teachers to develop lesson plans together, analyze student data, and mentor one another. Mayor Martin J. Walsh, along with Stutman and top school officials, unveiled the proposal the day after Christmas. The mayor, a former union leader, has taken pride in brokering a deal with the teachers union, highlighting it as a major accomplishment Tuesday night in his first state of the city address. Walsh praised the vote Wednesday night. The city and the teachers union had been struggling for years to reach an agreement over lengthening the school day. The two sides had come close to an agreement two and a half years ago that would have added 45 minutes, but the two sides could not agree on additional pay for teachers and how much input staff should have on developing proposals for their schools. Michael O’Neill, the School Committee chairman, said he expects the committee to have lengthy discussions on the cost of the plan and on what measures the school system will take to ensure the time is used wisely. He said he was not surprised teachers approved the proposal. “Our teachers care about what is the right environment for our students to learn well,” he said in an interview. The School Committee is expected to vote Jan. 28. Sarah Burke, who is a Boston school parent as well as an inclusion specialist at the Bates and Conley elementary schools, said before the vote that she was torn, wishing the extra time was voluntary. As a parent, she said, her children do not need the extra time and she is worried that the longer day will take time away from their homework, afterschool activities, and down time to unwind. But as a teacher, she said, there are students in front of her every day who would benefit from more time. “It’s going to be a game-day decision,” Burke said before the vote. But in the end, she said, she raised her hand to signify a yes.